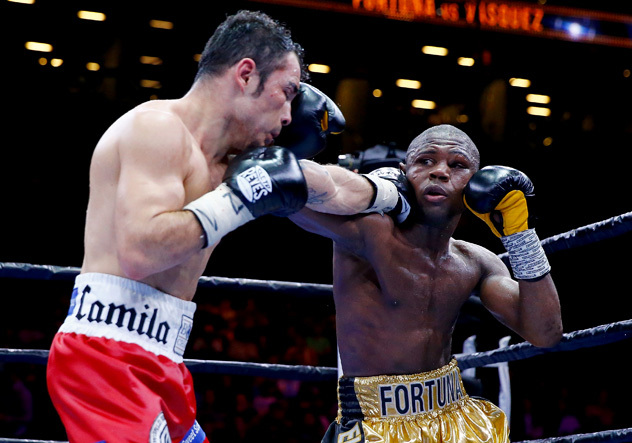 NEW YORK – Javier Fortuna used to carry that ticking time bomb in the back of his mind. Always that slight whisper, asking, “When will the endurance go, when will the shoulders and legs begin to stiffen and ache? When will all fall apart?” For once, in the biggest fight of his life, he didn’t have those doubts. For once, the fighter he envisioned himself being was the fighter that was actually in the ring, rampaging through Bryan Vasquez. Javier Fortuna (R) and Bryan Vasquez connect simultaneously during their fight on May 29, 2015. Photo by Al Bello/Getty Images. Fortuna, a 25-year-old from the Dominican Republic, went 12 strong rounds for the first time in three years and his reward was a thorough, though at times erratic, unanimous-decision victory over Vasquez before 7,372 spectators at Barclays Center Friday night. There was no doubt on the judges’ scorecards. John McKaie had it 116-112 for Fortuna (28-0-1, 20 knockouts), while judges Kevin Morgan and Tom Schreck each had it 117-111 for the Dominican, as did THE RING. Fortuna was the much more accurate puncher, connecting on a total of 237 of 637 punches (37.2 percent), landing 38 of 189 jabs (20.1 percent) and 199 of 448 power punches (44.4 percent). Vasquez (34-2, 18 KOs) often swung wildly, sometimes throwing wide, almost cartoonish punches – and it showed; he connected on 174 of 710 total punches (24.5 percent), while he was very guilty of loading up, landing a mere 19 of 194 jabs (9.8 percent). Vasquez connected on 155 of 516 power shots (30 percent). That didn’t seem to matter. Fortuna walked through everything. It wasn’t much of a fight. Though the bout had its spirited moments. In the closing seconds of the second round, Fortuna did reach Vasquez. In the third, Fortuna tagged Vasquez once again, but this time the Costa Rican responded by countering Fortuna into the ropes. But Fortuna, who landed 21 of 52 shots in the third (to Vasquez’s 10 of 57, 17.5 percent), closed the round with a flurry pinning Vasquez against the ropes. As the fight wore on, Vasquez began to wear out. His accuracy fell to shreds in the championship rounds, connecting on 17 of 102 punches. Fortuna, when he wasn’t taunting Vasquez or raising his arms in victory, connected on 39 of 96 (40 percent). On the untelevised undercard, light heavyweight Marcus Browne, from Staten Island, remained undefeated by going 10 rounds for the first time in his career with a unanimous decision over Cornelius White (21-4, 16 KOs). Browne (15-0, 11 KOs) appeared to have White in serious trouble in the fourth, when referee Michael Griffin stopped the action with White visibly wobbling and holding himself up on the ropes. In a sloppy, yet entertaining heavyweight fight, Keith Tapia (15-0, 10 KOs) stopped the slovenly, though game, Leo Pla (5-5-2, 2 KOs) at 2:42 of the eighth round. Featherweight Heather Hardy upped her record to 13-0 (2 KOs) in winning an eight-round, split-decision over Noemi Bosques (8-3-2, 2 KOs). Local lightweight Wesley Ferrer (9-0, 5 KOs), from Brooklyn, survived the first knockdown of his career to win a six-round majority decision over Jose Miguel Castro (4-4, 2 KOs). Ferrer had Castro in some early trouble, knocking him down in the first with a left hook. But Castro shocked Ferrer in the fifth by catching him completely by surprise with a flash knockdown. Amateur star Chris Colbert, another local Brooklyn product, made his much-anticipated pro debut with a second-round stoppage of Marquis Pierce (1-6). Colbert, fighting at featherweight, had control of the fight until finally finishing Pierce at 1:31 of the second. Lightweight Luis Franco (13-1-1, 9 KOs) stopped Guillermo Sanchez (15-16-1, 6 KOs) on a fifth-round TKO in the first fight of the night. Junior lightweight Javier Fortuna scored his sixth straight win with a dominant performance against Bryan Vasquez to win a junior lightweight title Friday at the Barclays Center in Brooklyn. NEW YORK -- Javier Fortuna, with his quick combinations and plenty of movement, gave Bryan Vasquez problems throughout their entertaining fight as he won a unanimous decision and a vacant junior lightweight title on the Amir Khan-Chris Algieri undercard Friday night at the Barclays Center in Brooklyn. Fortuna claimed a secondary belt -- Japan's Takashi Uchiyama, who knocked out Vasquez in the eighth round in 2012 in a title defense, holds the main title -- but he put on a fine display. Two judges scored the fight 117-111 for Fortuna and the third had it 116-112. ESPN.com also had it 117-111 for Fortuna, a fast and flashy 25-year-old from the Dominican Republic. "It's huge for me. I'm very proud. This is amazing. A great time," Fortuna said through a translator. "He's a very strong fighter. I did my best." Fortuna and Vasquez, who didn't seem to particularly care for each other in the buildup to the fight, promised to take it to the other man and go for a knockout. They delivered, coming out from the first bell and mixing it up, at least through the first half of the fight. "After the fifth round I stopped fighting and started boxing to score points," Fortuna said. According to CompuBox punch statistics, Fortuna landed 237 of 637 (37 percent) punches and Vasquez connected on 174 of 710 (25 percent). They threw and landed wild punches throughout the first round, although Fortuna appeared to have the edge. The fight calmed down a bit in the second round but Fortuna (28-0-1, 20 KOs), a southpaw, taunted Vasquez, pointing to his chin as though he was asking Vasquez to hit it. It picked back up again in the third as Fortuna began to land punches with authority and back Vasquez up. But Vasquez answered almost everything as they went back and forth backing each other up with hard shots. Vasquez's right eye was marked up and he had swelling on the left side of his face by the seventh round, but he was still attacking. But Fortuna, who had resorted to moving more than fighting, closed the round by hurting Vasquez with a series of hard shots that sent him into the ropes. In the eighth round, as Fortuna was popping Vasquez (34-2, 18 KOs), 34, of Costa Rica, in the face, he was also doing his best imitation of the Muhammad Ali shuffle. Fortuna rocked Vasquez early in the 10th round with a quick combination and backed Vasquez into the ropes. Fortuna, obviously feeling he was ahead on the cards, danced around in the 12th round and held his fist aloft in victory midway through the round, then raised his hands as the clock wound down. Staten Island light heavyweight prospect Marcus Browne (15-0, 11 KOs), a 2012 U.S. Olympian, got in a good workout as he beat up and routed Houston's Cornelius White (21-4, 16 KOs). Browne let his punches flow throughout the fight and was not seriously challenged by White, who lost his third fight in a row but was able to last the 10-round distance after getting knocked out inside three rounds in his previous two bouts. In the sixth round, Browne, well in command, sent White to the mat courtesy of a hard left hand below the belt. Referee Michael Griffin gave White time to recover and then Browne, a southpaw, continued to batter him en route to winning 99-91, 99-91 and 98-92. • Cruiserweight Keith Tapia (15-0, 10 KOs), of Puerto Rico, brutally knocked out Leo Pla (5-5-2, 2 KOs), of Wichita, Kansas, in the eighth round of what had been an action fight. In the eighth and final round, Tapia crushed Pla with a left hand on the chin that had him out on his feet and in terrible trouble. But before referee Arthur Mercante intervened, Tapia got off another flush left hand that knocked Pla out cold at 2 minutes, 42 seconds. He was on the canvas several minutes receiving medical attention. • Brooklyn junior featherweight Heather Hardy (13-0, 2 KOs) won an eight-round split decision against Noemi Bosques (8-3-2, 2 KOs), of St. Petersburg, Florida, in an action-packed fight. Hardy got the nod 79-73 and 77-75 on two scorecards and Bosques won 77-75 on one scorecard. • Brooklyn lightweight Wesley Ferrer (9-0, 5 KOs) and Jose Miguel Castro (4-4, 2 KOs), of Puerto Rico, exchanged knockdowns, but Ferrer came out on top in a hard-fought majority decision. Ferrer dropped Castro in the first round and then returned the favor in the fifth round. In the end, two judges had it for Ferrer, 58-54 and 57-55, and one judge scored the fight 56-56. • Brooklyn featherweight Chris Colbert (1-0, 1 KO) blew out Marquis Pierce (1-6, 0 KOs), of Newark, New Jersey, in his pro debut. He dropped Pierce with a vicious right hand on the chin in the final seconds of the first round and then sent him staggering into the ropes in the second round, prompting referee Mercante to wave off the fight at 1 minute, 31 seconds. • Junior lightweight Luis Franco (13-1-1, 9 KOs), a former Cuban amateur standout who defected and now lives in Miami, laid a beating on Guillermo Sanchez (15-16-1, 6 KOs), of Buffalo, New York, until Sanchez's corner threw in the towel at 1 minute, 51 seconds of the fifth round of their eight-rounder.